Complex special NPK fertilizer with Magnesium and Trace elements. Its high Nitrogen content promotes vegetative growth and flowering, Phosphorus triggers new root outgrowth and fruitation, while Potassium increases the yield and improves technological and organoleptic features of the crop. 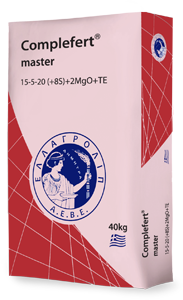 Complefert® master can be used in basic as well as in surface fertilization of cultures. As a basic fertilizer it is recommended for all soil types that have sufficient Phosphorus content and specifically in cultures with high Potassium requirements such as arboriculture, vine and horticulture. As a surface fertilizer it is a top choice for all soil types and for all culture types that receive late surface fertilizations. In this case, it is applied after boll retention and provides the required Nitrogen and Potassium quantities that are essential for crop growth and maturation.